Methane hydrate forms in the gas hydrate stability zone (GHSZ). This is where the required pressures and temperatures are present for methane and water molecules to combine and form a clathrate. 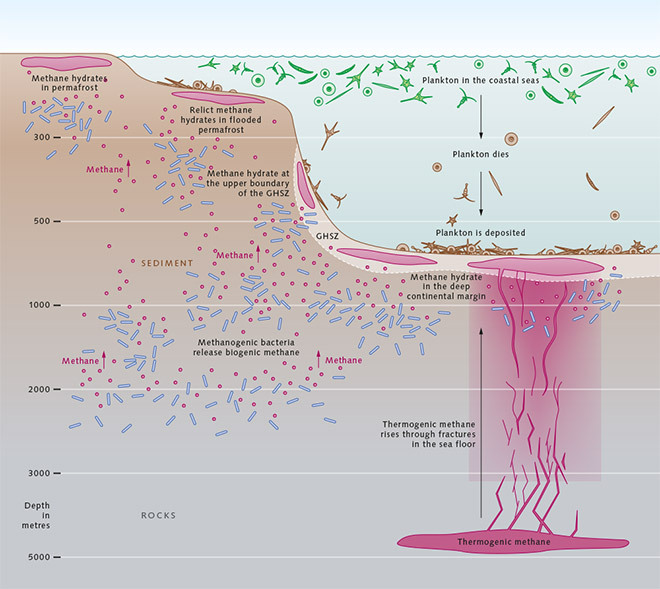 Methane rises from the depths up to the GHSZ: in the deep upper sediment layers biogenic methane, produced by microorganisms, is released. In still deeper sediment layers, methane is created through the chemical transformation of biomass at very high pressures and temperatures (thermogenic methane). It can rise through fractures up to the gas hydrate stability zone. Methane hydrates are found in various regions: in Arctic permafrost, in relict permafrost that was flooded after the Ice Age, and on the upper and lower continental margins.